We think of CES as the time for all the major TV announcements, but more and more companies are holding back their big stuff until later in the year. See Vizio waiting until March to announce a new lineup of TVs priced to sit between their budget and high-end reference sets. But the real kicker of their 2016 P-series? It includes a tablet as a remote. When the reps at Vizio first displayed the new remote, they seemed proud—and I was worried about gimmick. Yeah, a 6-inch, 1080p Android tablet (rocking Lollipop OS and 16GB of storage) included with every TV sounds cool, but it also means another device you have to charge every day (they include a dock for wireless charging), and God help you if you drop it or lose it. Helpfully Vizio is also including a traditional remote with each TV—so you’ll be able to turn the set on and adjust audio even if your tablet is charging. The real importance of the tablet was shown off when Vizio screencasted a Netflix show from the tablet to the TV. 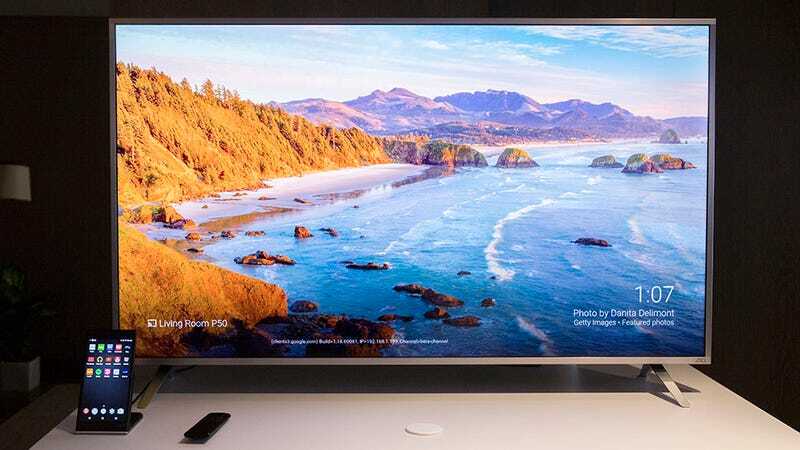 Instead of building a smart TV based on Android or Roku or some third-party smart TV OS, Vizio has opted to build Google Cast into the P-series. If you’ve got a device that can cast, you can watch whatever you like on the P-series set. You can also control the entire TV with any Android device by downloading Vizio’s new SmartCast app. In addition to controlling the TV, the app automatically aggregates content for screencasting from every other app on your phone. So whatever is on your Plex is displayed right next to what’s available on Netflix or Hulu or Amazon Prime. It also works with other Vizio devices with built-in Google Cast, including a new soundbar, a wireless speaker speaker shaped a lot like the Amazon Echo, and another positioned to compete against the Sonos 5. Notably Vizio’s P-series is the first set of TVs capable of working with Google Cast in 4K. The sets also support wider color gamuts and HDR—specifically DolbyVision HDR. That’s the same kind of HDR Vizio includes in their super pricy, high-end sets, and one of the two HDR formats Netflix currently supports. This means when you’re screencasting Netflix shows in 4K/HDR, you’ll enjoy a wider range of colors and better details in areas of extreme low light and highlights. The P-series will start at $999.99 for a 50-inch set and hit a whopping $3799.99 for a 75-inch set. While I’d be hesitant to ever drop $3800 on a TV, that 50-inch set could be the best looking TV you’ll be able to buy for under $1000. Particularly as it’s the rare sub-$1000 set to include HDR, wider color gamuts, and full-array backlighting (with 128 zones). We’ll know more when we get one in for review. The P-series and it’s whizzbang tablet will be available starting today.